Click here to visit the Store Brand Meds facebook and like them. Then on the “Happy Healthy Summer” tab, fill out the form to enter their sweepstakes. 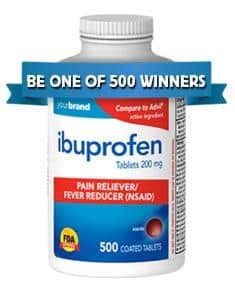 500 winners will each receive a 500-count bottle of ibuprofen (worth $8). You’ll have until August 25th to enter. Good luck!